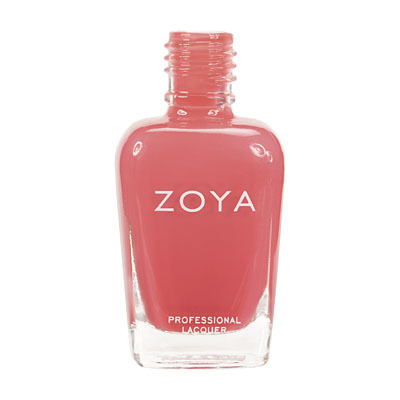 Zoya Fast Drops is a miraculous liquid that dries polish completely from top coat through base coat. Never smudge your manicures again! Impatience is a virtue. 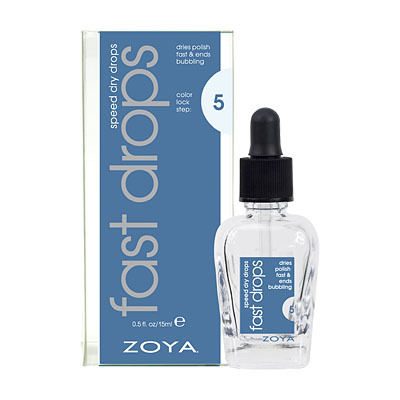 Manicures and pedicures are good to go with Zoya Fast Drops Speed Drops. These phenomenal bubble-preventing drops completely dry your topcoat,polish and base coat fast and enhance color vibrancy. Color stays fresh and gorgeous for up to two weeks. Apply one drop to base of each nail, tilt hand and allow product to spread naturally. Polish will dry in just five minutes. 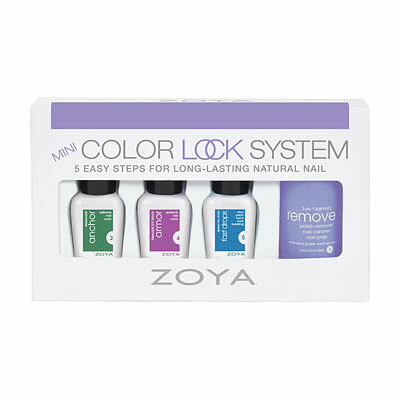 To extend your color up to two weeks, apply over Zoya Armor Topcoat every two days. 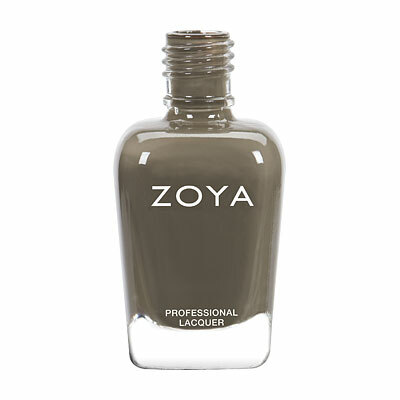 Zoya Fast Drops Drying DropsMiracle Dry Drops!! These Fast Dry Drops are nothing short of a Miracle PRODUCT! That is ALL I need to say. Yet I will go on- I love to do crazy nails- yet I have NO TIME to wait for thick nails to DRY- as I am usually on the go. So instead of being a good girl, I put on thick layers and always had ruined nails :( I am learning to take more time for myself now- but when it comes to my nails- I don`t need a lot of time anymore! These drops are my go to product EVERY Time! I also use them on my daughter who naturally gets very antsy when I do her nails! It seems like every time I paint her nails she gets a magically itchy nose :) Well Now I put these on her too and we both have perfect looking nails every time, no matter what we paint on them it dries and stays! My only tip would be to put a paper towel under your hands to catch any excess oil residue that may drip from the drops. The product has a touch of a dry oil consistency. works great my customers love it I never had a problem!!!!!!! I have always been skeptical about using nail polish because of the amount of time it takes to dry. After reading the reviews on this product, I decided to try the whole nail polishing thingy again. I followed the directions and applied this after a base coat layer, 2 layers of polish and topcoat. Like magic, my nail was dry in less than 5 minutes actually. I also tried this with the OPI nail polish and again, it worked ilke magic. I would give it a 5 if I could...I highly recommend this product. 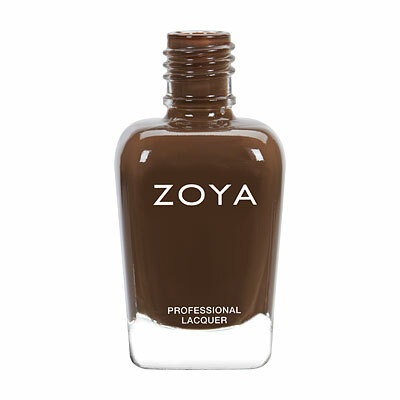 Zoya Fast Drops Drying Drops 0.5ozReally work! These are wonderful! I don`t know if they actually work in 5 minutes-I combined the drops with my UV nail dryer and they were done in 120 seconds (the dryer`s timer setting). Won`t do a manicure without these! I recently discovered Zoya and fell in love. I always paint my nails before bedtime and decided to try these drops. After base coat, 2 coats of color, and top coat, I use these drops. Within 5-10 minutes I can go to bed without fear of sheet marks or scratches. Can`t say enough good things. Love this product! mine came without a dropper, rendering the entire bottle useless. I had to buy a different dropper that doesn`t and adapt, but really?? is there no quality control at zoya?? the drops themselves work ok, depending on the number of coats and type of polish used. There are better products out there. I`m disappointed. With the recommended one coat of Anchor, two thinnish coats of Zoya color, and one coat of Armor, my polish is still easily dentable a few hours later with these drops. I`m not able to get on with my day worry-free for HOURS, which means I still really only get to paint my nails on my day off if I want a perfect mani. I`ve used this the last couple times I`ve done my mani and I get bubbles from this. Where there were none before I applied there are now. Very very noticeable, don`t think I`ll use them again...not cheap so I think it was a waste of money. Zoya Fast Drops Drying DropsWay overpriced for the ingredients. This is made of dry silicone derived oils. This product is way over priced. It would be MUCH cheaper to buy a 16 oz. bottle of cyclomethicone or dymethicone from a handmade bath and beauty supplier. Better yet, use fractionated coconut oil. I have found that my nails are more susceptible to dings and digs just 40 minutes after using these fast drying drops. I am seriously disappointed in this product and the cost. Check the Facebook fan page and ask questions before putting your money down on these drops. So I wouldn`t say these drops are the most amazing product of Zoya`s I`ve tried, but they do work pretty well.. I used two coats of Zoya polish and a top coat and then used the fast drying drops. The drops probably cut my dry time down to about 30 minutes rather than hours it would have taken, but it definitely took longer than 5 minutes for my nails to dry. Zoya Fast Drops Drying DropsDoes an Amazing job! I`ve used other products, and NOTHING compares to this. This stuff gave me "action ready" nails 5 minutes after I put on Armor. Zoya Hurry Up Drying DropsThe Best on the market!!! These drops are a HUGE timesaver! I`ve used other brands & they DO NOT compare to Zoya. My nails are dry within 5 min of applying the drops! Thanks for an amazing product!! Zoya Hurry Up Drying DropsAwesome! This stuff is great! I was skeptical, but it really works. Now my nails look beautiful, and I can use my hands normally with confidence within minutes instead of hours. Zoya Hurry Up Drying DropsAmazing! I was skeptical, but really hoped they`d work, and they do!! Really well. I just banged a new manicure, hard, against a metal surface (accidentally) and no dent! Zoya Hurry Up Drying DropsFantastic! These drying drops are wonderful! They allow me to do my nails and continue on with my day! No more smudges or waiting around for my nails to dry!